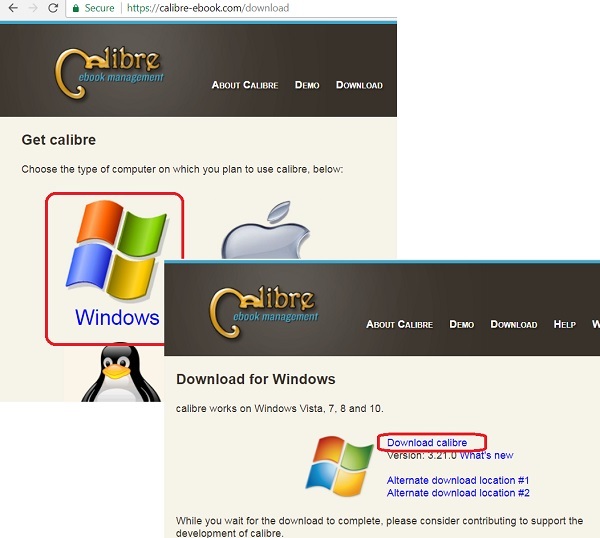 How to Download and Install Calibre for Windows? You can follow this tutorial to download and install Calibre for your Windows computer. 1. Go to Calibre download site. 2. Click "Windows" icon. You see Calibre for Windows download page. 3. Click "Download calibre" link. You see download started. 4. Save the download file to \fyicenter\calibre-3.21.0.msi. 5. Run \fyicenter\calibre-3.21.0.msi to start the installation. 6. Finish installation with default settings. 7. Search and run "Calibre". You see Calibre running.